Rarely seen 1961 Buick Invicta "Bubble Top"
The body, floors and trunk are very nice and solid except for some rust on the passenger side... Maybe from the holes left by missing molding. 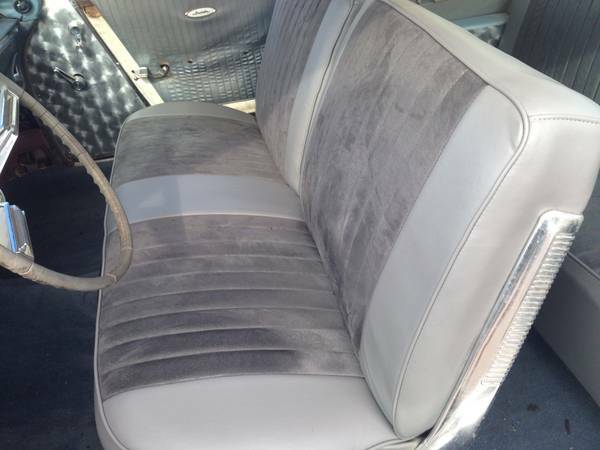 In the interior you'll see that the seats are newly reupholstered with grey vinyl / grey suede inserts. The dash houses a set of non working original gauges as well as an original Sonomatic AM radio. Under the hood you'll find a clean engine bay with a PRO built 496 big block by Morrison's Machine Shop in Glendale, Edelbrock multi port fuel injection. Attached to the engine is a 700R4 automatic transmission. The car sits on a set of 5-spoke Coys 20" wheels. The car is equipped with power steering and has been lowered slightly to give a more aggressive stance and set off the 5-spoke rims. All powertrain has about 2k miles in 8 years. This is a beautiful and rarely seen Buick Invicta Bubble Top and it is ready to drive.